Primorus Investments (PRIM) says that investee company Sport:80 has delayed its flotation because it has been tidying up its shareholder register. Fintech company Engage Technology is also seeking to float later in 2019 following new product launches. Engage raised £2.6m at £22 a share at the end of 2018, whereas the average buying price by Primorus was £20.03 a share. Investee company, AIM-quoted Greatland Gold (GGP) has published results from the second drilling campaign at Havieron in Western Australia. Every drill hole intersected mineralisation and they extend the overall mineralisation. Drilling will recommence in March. Primorus has raised cash by selling most of the stake in UK Oil and Gas (UKOG) and Primorus was debt free at the end of 2018. NEX has decided not to suspend trading in the shares of VI Mining (VIM) even though its corporate adviser Daniel Stewart is no longer a member of NEX. VI Mining had little or no notice of its adviser’s withdrawal. A new corporate adviser is being sought. Milamber Ventures (MLVP) has acquired apprenticeship training provider Astara Training for £16,666 in shares at 9p each. Milamber lost £179,000 in the third quarter and there was £30,000 in the bank at the end of 2018. Panther Metals (PALM) has announced the initial results of exploration activity at the Bear Lake project in Ontario. There was gold in soil anomalies at four of the five areas tested. Four areas have quartz vein sample assays above 5g/t gold. Two samples had large grade samples. The next phase of exploration is being planned and could start in the second quarter of 2019. Auxico Resources Canada Inc (AUAG) has signed a deal that could enable it to earn a 70% interest in a joint venture that owns the Palha tantalum property in northern Brazil. DP Poland (DPP) is running short of cash and is more than doubling its share capital through a heavily discounted placing raising £5.3m at 6p a share, with the possibility of an additional £500,000. The Domino’s Pizza franchisee for Poland has found competition is getting tougher and growth has slowed. The cash is required to cover losses and open more outlets. Peter Shaw is stepping down as chief executive at the end of June, nearly a decade after founding the business. Ticketing and queueing technology provider Accesso Technology (ACSO) is reviewing its investment priorities although it says that 2018 figures should be broadly in line with expectations. These will be published on 27 March. A deal fell through and this cost $1.7m. Tom Burnet is moving from executive chairman to a non-exec role. The share price is less than one-third of last year’s high. BlackRock has cut its stake below 5%. Midatech Pharma (MTPH) has launched a placing and 0.318-for-one open offer to raise up to £4.75m at 3.85p a share on top of the £8m subscription by former AIM company China Medical System Holdings, which will licence products for the Chinese market. The clinical trial for cancer treatment MTD201 will cost up to £7m. Duke Royalty (DUKE) is acquiring its UK rival Capital Step and this will double the size of the portfolio to eleven investments and diversify it in terms of sectors. There is an initial £10m cash payment and the assumption of debt of £11.65m. There is performance related consideration of up to £1.5m. The deal is immediately earnings enhancing. Visa has increased its bid for Earthport (EPO) from 30p a share to 37p a share, which beats the Mastercard offer of 33p a share. The latest bid values Earthport at £247m. Taptica (TAP) has launched a recommended bid for RhythmOne (RTHM) and this will create one of the largest video advertising companies in the US. The offer is 28 Taptica shares for every 33 RhythmOne shares. Taptica shareholders will own 50.1% of the enlarged group. A $15m share buyback programme is planned after the merger. Ofer Druker will become chief executive. Polemos (PLMO) has finalised the details of its reverse takeover of Digitalbox Publishing for £10m in shares and it is also acquiring the owner of the Daily Mash satirical news website for up to £1.2m in cash and shares. The model for the Entertainment Daily website will be used to improve the performance of the Daily Mash. A placing will raise £1.02m at 14p a share. The company will change its name to Digitalbox. Hardide (HDD) is raising £3.6m at 1.5p a share so that it can move to new premises in the UK and invest in additional equipment. The surface coatings company is experiencing increasing demand from the oil and gas sector and there is potential for orders from aerospace companies. It will take two years to fully equip and move into the new facility. Hardide also intends to consolidate 40 shares into one new share. finnCap has raised its forecasts for Tracsis (TRCS) following recent acquisitions. There is a 3% increase in earnings per share for this year and an 11% rise to 30.5p next year. Stride Gaming (STR) has traded in line with previously downgraded expectations. Cost cutting continues to cover higher regulatory and tax costs. The online gaming operator will report a lower profit in 2018 and it is set to fall again in 2019. Net cash was £22.1m at the end of 2018. Bowmark Capital has offered 110p a share for Tax Systems (TAX) and discussions continue. Tax Systems reduced net debt from £20.5m to £13.9m by the end of 2018. Pre-tax profit of £5.8m is forecast for 2018. Victoria (VCP) has sold surplus land in Kidderminster for £2m. The land was in the books for £100,000 but it has obtained planning consent for housing. Starcom (STAR) has renegotiated its agreement with Xplosive in South Africa, having originally announced it in October 2017. Xplosive has signed a 36-month agreement to pay a monthly fee for each of the Kylos units supplied for the monitoring of cattle. The fees are higher in the first six months and then reduce. The agreement should be worth $500,000. Strix Group (KETL) has offered to acquire most of the assets of HaloSource (HAL) for $1.3m. Strix has provided working capital of $100,000. Due diligence is being carried out on the water filtration technology and if the deal goes through the cash will pay creditors, but there will be nothing for shareholders. Prospex Oil and Gas (PXOG) has announced that the Selva gas field in northern Italy has net 2P reserves of 13.3bcf and there are 2.26bcf attributable to Prospex, which has a 17% stake. Selva could start production in 2020 at a rate of up to 150,000 cubic metres/day. Tau Capital (TAU) plans to raise cash via a placing through Peterhouse and then a capital distribution will be made to all shareholders. This will enable Tau to seek an acquisition. It has until 18 April to secure a deal or trading in the shares will be suspended. Armstrong Investments has increased its stake from 11.7% to 15.7%. Evgen Pharma (EVG) says that the SFX-01 clinical trial for subarachnoid haemorrhage is on course having completed recruitment and the primary endpoints should be available in the second quarter. Partners Investment Company has acquired at 3.15% stake. Sports Direct International (SPD) made a £15m offer to buy Patisserie Valerie from the administrator, but this was not deemed enough. Even a higher selling price won’t provide anything for Patisserie Holdings shareholders. Solicitor DWF plans to raise £75m via a March flotation an some of the cash will repay members’ capital contributions as well as invest in the business. Existing shareholders will also sell shares and partners’ remaining stakes will be locked up until April 2024. 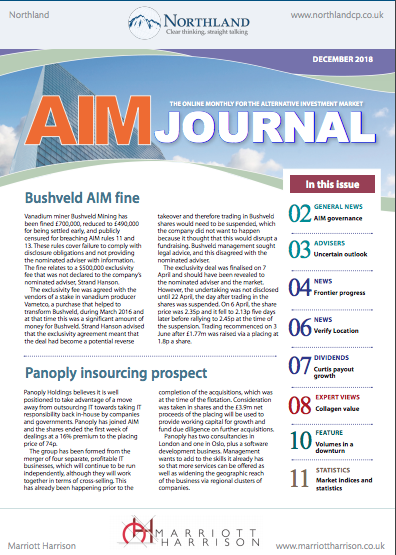 Two former AIM-quoted companies are coming together to join the standard list. Daniel Stewart Securities, which is closing its broking business, is making an offer for Atlantic Carbon, which was previously known as Atlantic Coal, where Adam Wilson, who has had connections with Daniel Stewart, is executive chairman. Singapore-based backer Epsilon Investments refused to put more money into the broker and that is why it is closing. Epsilon holds a majority stake in Hyde Park Holdings, which owns broker Novum Securities. Last October, SeeThruEquity research suggested that Atlantic had an equity value of $86.8m and $68m of debt. In 2017, Atlantic was the largest producer of anthracite in the US with a market share of one-third based on 1.18 million tonnes produced. 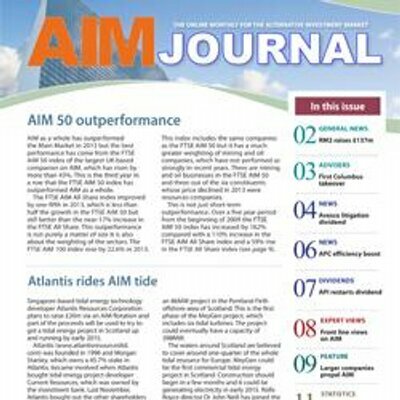 Atlantic is expected to have moved into profit in 2018, although it did generate cash from operations in 2017. The owners of more than 50% of Atlantic shares have agreed to accept the bid of 1.5587 shares for each Atlantic share. Thalassa Holdings (THAL) is offering 14.64p a share in cash and 0.26 of a share for each share in The Local Shopping REIT. Thalassa already owns 25.5% of the bid target, which is valued at 32.8p a share. The bid is an alternative to the winding up of The Local Shopping REIT. Blockchain Worldwide (BLOC) is no longer acquiring blockchain technology developer Chorum Group because of political uncertainty affecting the UK equity markets. Former Avanti Communications boss David Williams is the director of Chorum. Blockchain Worldwide has more than £1m in the bank and is also looking at other technology sectors for acquisitions. Drilling of the Colter appraisal well in Dorset has commenced and United Oil and Gas (UOG) has a 10% interest. The drilling should take three weeks. The Selva gas field in Italy has net 2P reserves of 2.7bcf attributable to United, which has a 20% stake. Selva could start production in 2020. United intends to move to AIM. Oil and gas producer Zenith Energy (ZEN) has raised £607,000 in Canada and the UK at C$0.05 a share and 3p a share respectively. Motor finance provider S and U (SUS) has confirmed that its figures for the year to January 2019 will be in line with expectations. The Aspen property bridging loan business had a loan book of £18m at the end of January 2019. Cautious lending criteria means that new business has slowed in recent months and this has led to a 5% 2019-20 earnings downgrade to 230.1p a share. BATM (BVC) has won a $3.2m cyber security contract and this takes contracted revenues from this government customer to more than $10m. The latest contract will be delivered this year. Chesterfield Resources (CHF) is expanding its exploration programme in Cyprus. Initial drilling in an area near historic mining has shown gold, copper and zinc mineralisation. Chesterfield is also applying for licences to extend its licence area. Dev Clever (DEV) has launched pay per play multi-player, virtual reality game Vanguard: Fight for Rudiarius in Harlow shopping centre. The game will be rolled out to other UK sites. Bluebird Merchant (BMV) has applied for a grant to help finance drilling at the Kochang project in South Korea and there should be news by the end of the month. There has also been a permit application to develop Kochang. Ecommerce software provider Netalogue Technologies (NTLP) moved into profit in the first half and had £648,000 in the bank at the end of September 2018. Revenues increased by £168,000 to £647,000, even though subscription-based pricing is reducing the initial revenues from B2B clients. A loss of £60,000 became a pre-tax profit of £142,000, helped by lower operating expenses. Veni Vidi Vici Ltd (VVV) is acquiring a 51% stake in a licence in the Shangri La gold, silver and copper project in Western Australia for A$220,000, which is payable to Goldfields Consolidated in the form of 190,000 shares and A$20,000 in cash. The shares cannot be sold for three months. VVV will spend an initial A$300,000 over three years and Goldfields will receive a 10% management fee. Coinsilium Group Ltd (COIN) has raised £367,000 at 4p a share and each new share comes with a two-year warrant exercisable at 7.5p a share. If the share price averages more than 15p for five consecutive days, then the company can require the warrants to be exercised. Gastropubs operator Barkby Group (BARK) has signed heads of terms to acquire Northamptonshire-based upmarket car dealer Centurian Automotive Ltd. The most recent accounts were for a dormant company and shows £200 in the bank. Quetzal Securities Ltd sold 6.75 million shares in Pelican House Mining (PHM) for 0.5p each and Eight Capital Partners (ECP) acquired 8.25 million shares at 0.491p each. Quetzal subsequently sold a further 6.75 million shares in Pelican shares, leaving a 13.2% stake, to Eight Capital at 0.5p a share, taking its stake to 15.3%. Hydro Hotel, Eastbourne (HYDP) has declared an unchanged total dividend of 21p a share for the year to October 2018. An interim of 7p a share will be paid in January (ex-dividend 20 December) and a final dividend of 14p a share paid in May (ex-dividend 18 April). Ace Liberty and Stone (ALSP) has appointed Northland as broker. EPE Special Opportunities Ltd (EL.P) had a NAV of 200.95p a share at the end of November 2018. The shares are trading at 160p. Construction consultancy Driver Group (DRV) reported a 2017-18 pre-tax profit of £3.8m, up from £2.5m, and it is returning to paying dividends with a 0.5p a share payment. Net cash is £6.9m, helped by a property disposal, and this could reach more than £10m by September 2019 even after dividend payments. The Diales expert witness business is becoming an increasingly important revenue generator and overall utilisation levels have improved. There has also been a focus on better margin work in the Middle East. SigmaRoc (SRC) is in the process of acquiring precast concrete products supplier CPP Building Products for £15.2m, although the deal requires shareholder approval for share issues, so it will not happen until early January. CPP is based in north west England and fits well with the existing precast concrete business. In the year to August 2018, revenues were £20.9m and EBITDA was £2.6m. This year’s trading is in line with expectations. There are plans to refinance the convertible loan notes. Nexus Infrastructure (NEXS) had already warned about delays to its utility connection contracts with housebuilders and the 2017-18 figures were slightly better than expected with flat pre-tax profit of £9.2m. Nexus has a strong order book and could increase its 2018-19 pre-tax profit to £10.4m. The new electric vehicle charging points division will take time to build up. Advanced coatings provider Hardide (HDD) has benefited from an upturn in demand from the oil and gas sector. It is also getting nearer to obtaining its first aerospace orders. Hardide remains loss-making and this will still be the case next year as it continues to invest in increasing capacity in the UK and US as demand grows. Curtis Banks (CBP) has purchased around 600 SIPPS with assets of £180m from Hargreaves Hale, which will continue to manage the assets. Curtis Banks will launch a new SIPP product in January. Clinical trials manager Venn Life Sciences (VENN) is collaborating with Open Orphan DAC. The two firms will share resources in the orphan drugs market. Venn is raising £1m from a two-year loan note issue. WH Ireland has upgraded its forecast for banknote authentication and brand protection technology business Spectra Systems (SPSY) for the second time. The underlying pre-tax profit forecast has been raised by 10% to $4.5m. The 2019 forecast, which had previously been upgrade by 16%, is maintained for the time being. Kibo Energy (KIBO) says that its 60%-owned subsidiary MAST Energy Developments has an exclusive option to undertake due diligence and acquire three peaking power sites totalling 31.3MW. This would provide initial revenues for Kibo later next year. Kibo has renewed its memorandum of understanding with Mozambique-based electric utility Electricidade de Mocambique for the financing and operation of the Benga independent power project. eServGlobal Ltd (ESG) says that 2018 revenues will be lower than expected due to weak trading at the PayMobile business and the failure to close orders. The PayMobile business may be sold and the focus will be the HomeSend remittances business. NWF (NWF) says feeds demand was strong in the summer because of a lack of natural grazing. In contrast, the hot weather held back demand for fuels. A Solihull-based fuel distributor has been acquired. The food distribution business continues to trade at around capacity because of contract wins. 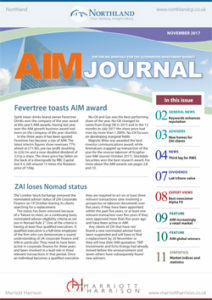 The interims will be published on 29 January. ReNeuron (RENE) has important clinical trial results coming up in the next 18 months. A retinitis pigmentosa treatment is in phase I/II trials and there should be data in mid-2019. A phase IIb trial for a CTX cell therapy-based treatment for chronic stroke is due to report by early 2020. There was £30.7m in the bank at the end of September 2018. Management is seeking partners to help it to make the most of its technology. PhotonStar LED Group (PSL) has raised £100,000 at 0.02p a share and this will enable the board to assess new business opportunities. Property adviser Fletcher King (FLK) is maintaining its interim dividend at 1p a share even though pre-tax profit has dipped from £148,000 to £132,000. Ratings appeals revenues were lower. There is £2.28m of cash in the balance sheet. Kromek (KMK) has secured an initial contract with the US Department of Defense worth $2m over 12 months. The plan is to develop a proof-of-concept device for a vehicle-mounted biological threat identifier. Crossword Cybersecurity (CCS) started trading on AIM on Friday and the share price ended the day at 272.5p. Crossword raised £2m at 290p a share. Volex (VLX) is buying cable assemblies and connectors manufacturer GTK for £14.3m in cash and shares. in the year to July 2018, GTK generated a pre-exceptional operating profit of £1.7m. There was £1.3m in the bank. The deal is earnings enhancing. African Battery Metals (ABM) has found it difficult to raise the cash it requires and trading in the shares has been suspended. The company wants to come to a settlement with creditors so that it could continue to trade. Smaller company mergers and acquisitions business K3 Capital Group (K3C) is cautiously optimistic but the full year outcome will depend on the timing of deals. There could be a small dip in pre-tax profit to £7m this year and there could be a corresponding dip in dividend from 11.2p a share to 10.8p a share. Telit Communications (TCM) says that it will not complete the sale of its automotive business until next year. Telit is expected to make a 2018 loss. Further cost savings are being made in the Internet of Things operations. More bad news from Filtronic (FTC) with sales of Massive MIMO antennas lower than expected. The main customer has reduced its forecast demand. The capitalised development costs of £500,000 will be written off and options are being reviewed. The rest of the business is trading in line with expectations. Filtronic will be loss-making this year. Net cash was £2.3m at the end of November 2018. Science Group (SAG) has ended its formal sale process because of stockmarket and exchange rate uncertainty. The strategic review continues. Trading is in line with expectations and the company will recommence the share buy back programme. Net cash was £6.4m at the end of November 2018. Like-for-like sales growth has been slowing at DP Poland (DPP) and this means that progress in 2019 is unlikely to be as good as expected. This means that it will take longer to reach profitability. Rivals have been spending money on marketing and warm weather has also held DP Poland back. A full year trading update will be published on 29 January. Taptica International Ltd (TAP) plans to spend up to $10m on buying back shares and it has already spent nearly £110,000. There was net cash of $42.1m at the end of June 2018. Tristel (TSTL) says that the US regulatory process for its disinfection products is on track and interim pre-tax profit should be £2.2m. TomCo Energy (TOM) has managed to secure £550,000 at 2p a share. The previous £532,000 placing at 8.5p a share was pulled. Laurence Read has become a non-executive director. RA International (RAI) has won a five year contract worth up to $5.6m from a US corporate client in Central Africa. Circassia Pharmaceuticals (CIR) is moving to AIM and it has decided to exercise its option to acquire US rights to COPD treatment Tudorza from AstraZeneca. This deal should complete by the end of the year and it will trigger a payment of $5m. A further $20m is payable upon approval of Duaklir and then there is further deferred consideration of $100m. Tex Holdings (TXH) has warned that second half earnings will be lower than anticipated due to delayed deliveries and reorganisation costs. Cadmium-free quantum dots developer Nanoco (NANO) is on course to complete the expansion of its Runcorn facility by the end of 2018 with commercial volume manufacturing by the middle of 2019. Lb-shell (LBP) is being wound-up because of potential litigation relating to before it became a shell. There is unlikely to be anything left for shareholders. Giant Saint Technologies Ltd (GST) is installing a $1m data centre in Singapore. Brewer and pubs operator Daniel Thwaites (THW) says that net debt has increased from £34.1m to £47.6m at the end of March 2017 because of investment in the brewery and pubs plus acquisitions. The benefits of this investment is starting to show through. Full year revenues from continuing operations were slightly lower at £84.4m, while operating profit improved from £11.5m to £12.1m. The total dividend is unchanged at 4.46p a share. Churchill Mining (GHL) has switched from AIM to NEX although trading in the shares remains suspended. Churchill’s main focus is the international arbitration claim against the Indonesian government. Good Energy (GOOD) received applications for more than £10m of the corporate bonds on offer. The energy supplier has closed the online offer but postal applications close on 12 June – assuming the maximum application level of £20m has not been reached before this. Coinsilium Group Ltd (COIN) has invested £56,000 in Singapore-based Indorse Pte Ltd, which is developing Indorse, a blockchain-powered professional social network. Coinsilium will also receive a number of Indorse digital tokens in the next few months. China CDM Exchange Centre Ltd (CCEP) reported a decline in full year revenues from £1m to £898,000. Pre-tax profit fell by two-thirds to just over £2,000. There is £2.3m in the bank and the NAV was £52.1m at the end of 2016. The company is investing in blockchain technology as part of its growth strategy. Asia Wealth Group Holdings Ltd (AWLP) says that the 45,000 shares it owns in Ray Alliance Financial Advisers have been transferred to the other two Ray Alliance shareholders without any authorisation. Asia Wealth paid $318,000 for the shares back in 2012. Asia Wealth has demanded that the shares are transferred back. Valiant Investments (VALP) has raised £45,000 at 0.1p a share. The cash will provide working capital and provide the ability to invest more in apps business Flamethrower. DX Group (DX.) has renegotiated the terms of the merger with Menzies Distribution which involves the payment of £40m in cash and shares equivalent to 65% of the enlarged share capital – this includes a 5% stake that will be held by the John Menzies pension fund. DX will still have to take on 17% of the pension fund. Cost savings of £10m a year are expected and a dividend is promised. Rebel shareholder Gatemore is backing the revised transaction. Things are still not running smoothly, though. The City of London police is investigating an allegation concerning DX. MP Evans (MPE) harvested 180,000 tonnes of oil palm fruit bunches in the first five months of 2017, which is one-quarter higher than in the same period of 2016. This is due to a mixture of improving weather conditions and maturing plants. In the same period, palm oil production increased from 37,900 tonnes to 60.100 tonnes. The average selling price has increased by $51/tonne to $606/tonne, while palm kernel prices moved from $414/tonne to $503/tonne. There could be some downward pressure on prices in the second half. Somero Enterprises Inc (SOM) has announced a special dividend of 13.3 cents a share on top of the normal dividend. This will cost $7.5m and leave the construction equipment company with much more than $10m in the bank even before allowing for cash generated so far this year. Shareholders on the register on 28 July will receive the dividend. Trading in Europe has been strong and the only disappointment has been North America where business has been delayed. Best of the Best (BOTB) is also paying a special dividend out of its cash pile. Full year revenues grew 7% to £10.8m, while pre-tax profit improved from £1.1m to £1.5m. A normal dividend of 1.4p a share will be paid plus an additional 6.5p a share as a special dividend. There are also plans for the competitions organiser to increase marketing spending. Waste to energy systems developer PowerHouse Energy Group (PHE) has secured a collaboration agreement with a UK partner that will provide two tranches of funding for the demonstration unit and five systems. The total funding will be up to £500,000. DP Poland (DPP) has raised £5.25m at 43p a share. The cash will help finance 15 new Domino Pizza stores in Poland this year and finance loans for sub-franchise store openings in 2019. Trading in Savannah Petroleum (SAVP) shares has been suspended following an exclusive agreement to buy the oil and gas assets of a west Africa-focused company. The structure of the transaction has been agreed in outline and it will involve debt, shares and cash. Due diligence has been going on since January. The shares will remain suspended until a document is published for the reverse takeover. Nostra Terra Oil & Gas (NTOG) says that the general meeting requisition at US-focused oil and gas company Magnolia Petroleum (MAGP) is by former chief executive and founder Steven Snead using the shares that Nostra Terra has agreed to purchase. The proposals include the removal of chief executive Rita Whittington and the appointment the Magnolia board of Ewen Ainsworth, chairman of Nostra Terra, and Donald Phillips. Vianet Group (VNET) has restructured its business into two divisions: smart zones and smart machines. Smart zones is based on the fluid measurement and telemetry business with pubs. The US business is moving towards breakeven. The smart machines division is focused on vending machines and there is a significant addressable market. There was a dip in underlying pre-tax profit form £2.8m to £2.6m last year, with a small improvement forecast for this year. The dividend is set to continue to be unchanged at 5.7p a share. LiDCO (LID) has received 510k clearance from the FDA for the LiDCO Unity version 2. This will enable LiDCO to offer a high usage programme for a fixed annual licence fee. The head of US operations is already in place and ready to push ahead with the strategy. LiDCO is expected to move into profit in the year to January 2019. Shareholders are trying to requisition a general meeting at Irish gold explorer Conroy Gold and Natural Resources (CGNR) in order to remove six directors. Seamus FitzPatrick, James Jones, Dr Sorca Conroy, Louis Maguire, Michael Power and David Wathen are the directors that the requistioners wants removed and replace them with Patrick O’Sullivan, Paul Johnson and Gervaise Heddle. The three directors not affected by the requisition are Professor Richard Conroy, Maureen Jones and Professor Garth Earls. Disruptive Capital has made a bid approach to Stanley Gibbons (SGI). Telecoms services provider Toople (TOOP) raised £1.41m, before expenses of £150,000, and five million shares were issued to directors’ in lieu of a portion of the fees that they are owned. The subscription and offer are still open. On the day of the announcement, the share price fell 1.13p to 2.13p. There was a cash outflow of £552,000 in the six months to March 2017. Rainbow Rare Earths (RBW) has discovered several unrecorded veins at Gasagwe, which suggests that there is plenty of upside in the mineralisation resources at the Gakara rare earth project in Burundi. Mine construction is on course to deliver rare earth concentrate before the end of 2017. WideCells Group (WDC) says that it is authorised to sell its CellPlan financial product that helps people to afford stem cells treatment. There are plans to start selling CellPlan to Biovault stem cell storage customers. Cathay International Holdings (CTI) says that its 50.56%-owned subsidiary Lansen Pharmaceutical plans to pay a special dividend. Ace Liberty & Stone (ALSP) has acquired 1-5 Upper Market Square in Hanley for £9m. The tenants are Boots and National Westminster Bank. Prior to this deal, property holdings has grown 23% to £29.5m at the end of April 2016, while the NAV is £17.9m. The sale of Hume House for £3.55m – more than double the 2014 purchase price – should be completed by the end of 2016. Economic uncertainty has made it difficult to complete other deals. Management believes it can increase the size of the portfolio to £50m within in the next year without the need for more cash from shareholders. DXS International (DXSP), which provides software for clinical commissioning groups and GPs. Has reported a one-fifth increase in revenues to £3.25m in the year to April 2016. Pre-tax profit improved from £27,000 to £46,000. Progress has been held back by NHS but DXS continues to investment in developing software in order to widen the range it can offer. There was £315,000 in the bank at the end of April 2016 and debt has been reduced. Hellenic Capital (HECP) continues to seek an acquisition and it had £82,600 in the bank at the end of June 2016. Mark Jackson of Quetzal Securities, which has acquired a 29.9% stake, partly from director Gavin Burnell, at 0.3784p a share, has been appointed a Hellenic director. Ganapati (GANP) is not proceeding with the existing application for a gaming licence in the UK and will instead apply via new Maltese subsidiary Ganapati (Malta) Ltd. There will be licence applications to the regulators in the UK and Malta. Investment company Western Selection (WSE) increased its NAV from 75p a share to 79p a share in the year to June 2016. Since then £520,000 has been raised from selling 200,000 shares in toiletries supplier Swallowfield. That is a gain of £180,000 before expenses. The final dividend is 1.05p a share, making an unchanged total for the year to 2.1p a share. WMC Retail Partners (WELL) has agreed an extended lease on Cornish World Market on better terms and it will be able to commence the new retail development at the front of the market. More funding will be required for this and WMC is asking shareholders to allow it to issue up to £500,000 of five year secured loan stock. Two related parties will subscribe for £400,000 to replace existing loans. This is part of a £1.96m funding package with £1.26m coming from the bank and £300,000 from the landlord. A capital reorganisation will reduce the par value of the shares from 50p to 5p so that money can be raised through share issues. The general meeting will be held on 21 October. Angelfish Investments (ANGP) has lent a further £70,000 to 4 Navitas (Green Energy Solutions) Ltd. This takes the amount loaned to the Lancashire-based to £497,500 and this is repayable at the end of 2015. The loans have an interest rate of 12% a year. The cash will be used to acquire composite materials for manufacturing an upgraded version of the 4N-VAWT vertical axis wind turbine designed in partnership with Siemens. The wind turbine is lower cost and smaller. Employee owned business finance provider Capital for Colleagues (CFCP) has lent and invested more than £5m in its portfolio companies. There have been four main loans and investments in the most recent quarter. The NAV is 54.5p a share. Kryptonite 1 (KR1) has made its first investment into an initial coin offering (ICO) of SingularDTV. It has invested £5,605 for 462,931 SNGLS tokens that provide a claim to a portion of revenues and IP to show content – there are no voting rights. The tokens can be traded on the Consensys blockchain platform. The idea behind the business is to enable people to directly reward creators of content so that less is taken in fees. Trading in the shares of DagangHalal (DGHL) has been suspended after three directors failed to be re-elected at the AGM. This leaves three remaining directors. The shares will remain suspended until there is further information about the composition of the board. Investment company Draganfly Investment (DRG) is loaning IP developer AltEnergis (www.altenergis.co.uk) £60,000 for one year at an annual interest rate of 8%. AltEnergis was formed in 2011 and lost £53,000 last year. At the end of 2015, net liabilities were £11,000 but there is no value placed on the development of five technologies. The company’s strategy is to develop technologies that will attract deals with multinationals. There is a piezoelectric technology that the company believes can be adapted to use vibrational energy/human movement to recharge a phone on the move. This was developed with Swansea University and Solar Press Ltd. There is a gearbox condition monitoring technology being developed with Oxford University and GSS Avionics. At the time of its 2015 annual report, AltEnergis says that it was hoping to complete a reverse takeover of an AIM-quoted company and raise at least £1m. Mariana Resources (MARL) has acquired the early stage Bondoukou gold project in Cote d’Ivoire. The deal involves acquiring 80% of the holding company in return for $544,274 in shares plus paying obligations of $89,000 and lending $56,000 to the company to pay other loans. Up to $3.5m more could be paid based on the mineral resource defined. This is based on $0.5/ounce up to one million ounces and $1/ounce after that. Floorcoverings manufacturer Victoria (VCP) is buying Bradford-based underlay manufacturer Ezi Floor in a deal that will be earnings enhancing this year. Victoria is paying £13m – £6.5m immediately and the rest over four years – with up to £6.5m payable depending on the achievement of targets. Earnings per share forecasts for this year have been upgraded by 4% to 23.8p and by 10% next year to 26.5p a share. Net debt is forecast at £54.7m at the end of this financial year. Engineer Avingtrans (AVG) has announced details of its tender offer that will pay out £28m to shareholders. Each shareholder can tender up to 50% of their shareholding at a tender price of 200p a share – a 4.2% premium to the share price at the end of September. There is potential to tender more than 50% of a shareholding if others do not tender their full share. There will be 14 million shares left in issue. DP Poland (DPP) is raising £3.2m at 48p a share. The previous placing was at 15.8p a share. There was still net cash of £5.39m at the end of June 2016 but management wants to accelerate the store opening programme. The new target is 100 stores by 2020. There are currently 29, including 16 corporately managed, in seven Polish cities. The interim loss was £944,000. Park Group (PKG) is acquiring corporate employee and customer engagement company Fisher Moy International. The two companies have been working together for more than one year. This deal should be modestly earnings enhancing in the first full year and provides a new base in Buckinghamshire. Digital media provider Milestone (MSG) is collaborating with the Social Stock Exchange, which currently has 44 companies as members. The two organisations will introduce new members to each other , enter joint promotions and also establish an investment fund. Milestone will also offer training expertise. Versarien (VRS) is acquiring plastics manufacturing business AAC Cyroma in order to develop a graphene-enhanced plastics manufacturing operation. Versarien is paying an initial £1.925m with up to £200,000 more payable depending on profit figures in 2017 and 2018. – 2015 pre-tax profit was £166,000. Software provider Gresham Computing (GHT) has agreed to pay up to £4.55m for C24 Technologies in order to expand its data integrity business in the financial markets. The deal doubles the customer base and should be earnings enhancing next year. Gresham raised £3.32m at 105p a share. Industrial fasteners supplier Trifast (TRI) continues to trade strongly in the first half of its financial year and sterling weakness will be a further help in the second half. A new distribution centre has been opened in Barcelona. The profit forecast for the year to March 2016 has been raised from £16.9m to £17.6m to take account of currency movements. ZimNRG (ZIMO) is changing its investment policy and its name to MetalNRG. The new policy is to invest in natural resources businesses with no particular focus on any area. AIM-quoted Metal Tiger (MTR) has taken a 28.3% stake via a £50,000 investment at 0.2682p a share. That is a large discount to the market price of 1.25p (1p/1.5p), although it is similar to NAV at the end of August 2015. The par value of the shares has to be reduced before the new shares can be issued. Loeb Aron has become corporate adviser. Christopher Latilla-Campbell will be appointed as chairman and Paul Johnson of Metal Tiger as a non-executive. Care housing and health properties developer Ashley House (ASH) joined the Social Impact segment of ISDX on 10 February but it is retaining its AIM quotation. Ashley House (ASH) moved from ISDX (Plus-quoted) in January 2007. At that time £4m was raised at 150p a share, which valued the company at £40.6m. In the six months to October 2015, revenues jumped from £5.6m to £10.6m and went from a loss to a small profit. Net debt was £2.6m at the end of October 2015. The company has £10.7m of tax losses. At 9.5p (9p/10p) a share, Ashley House is valued at £5.5m. New Haven Trust has sold 3.2 million shares in Coinsilium (COIN) at 3.5p a share. Coinsilium floated at 10p a share and the shares are trading at 5p (5p/6p). New Haven had 3.53 million shares prior to the recent fundraising. There had previously been share issues at 8p a share and prior to that at 0.01p a share. So, New Haven could still have made a large profit on its shareholding. Just over 3.2 million shares were subsequently traded at 3.9p a share. There is no news about who bought these shares. Healthcare recruitment business Positive Healthcare (DOC) has secured a further £1.08m of funding through an issue of 7% bonds 2021. This takes the value in issue to £1.33m. The company had previously stated that £2m of bonds had been issued but it turned out that it did not receive the subscriptions for all these bonds. Management has tabled a cut price bid for printing services provider Tangent Communications (TNG) but marketing communications services provider Writtle Holdings has suggested that it may top the offer. The 2.25p a share bid values Tangent at £6.69m and it is 64% higher than the previous closing price. The bid is well below the net asset value of £31.6m at the end of August 2015. Even if you take the view that management has overpaid for its businesses then the NAV excluding goodwill is £6.79m. Tangent is profitable but the profit has been declining. However, Writtle’s indicative offer of no less than 2.75p a share, which is still a large discount to NAV. Writtle is run by the ex-management of former AIM company CA Coutts. Between 2005 and 2010 Graeme Harris was a director of Tangent Communications. Before that he was finance director of CA Coutts and since 2011 he has been a director of Writtle. DP Poland (DPP), the Domino’s Pizza master franchise holder for Poland, has achieved 13 consecutive quarters of double digit like-for-like growth in system sales. There are 24 stores in five Polish cities – 16 managed and eight sub-franchised. The stores are making a positive EBITDA but the group is still loss-making. Pro forma cash was £8.8m at the end of June 2015, so even with large cash outflows over the coming year there should be plenty of cash left at the end of 2016. However, the group will still be loss-making so the cash will decline as more is invested in new stores. Real Good Food (RGD) has acquired Chantilly Patisserie for £1.75m and it will become a division of the Haydens business. Devon-based Chantilly makes frozen desserts for caterers and pubs and this could provide an opportunity for Haydens to expand its own customer base, which is focused on retailers. Asset management performance software provider StatPro (SOG) is injecting its StatPro Portfolio Control (SPC) compliance software contracts into South Africa-based InfoVest Consulting in return for a 51% stake. This is a part of the software suite that has not migrated to the cloud. StatPro will consolidate the full revenues of this investment from 2016 so pre-tax profit will look better but there will be a minority adjustment after tax. The 2015 results are due to be published on 9 March. Lok’nStore (LOK) says that like-for-like self-storage revenues were 5.4% ahead in the first half. Higher prices and improving occupancy rates are behind this growth. Newer sites at Reading, Maidenhead and Aldershot are performing strongly. The document storage business is improving its performance. Herencia Resources (HER) has sent out the circular for the disposal of its Picachos project to a Chilean company. Herencia will receive $2m for 70% of the project, after six months $600,000 is payable for 7.5% and after a further nine months a final $2.5m is payable to take the stake to 100%. The company that holds the project has a book value of £1.36m. Due diligence is being undertaken. Herencia will concentrate on the Paguanta and Guamanga projects in Chile and the cash will finance their development. The general meeting will be held on 26 February. Specialist electronics distributor and manufacturer Acal (ACL) is trading in line with expectations so revenues growth should be nearly 10% to £297m in the year to March 2016 – organic growth will be around 2%. Profit is expected to rise from £11.8m to £14.4m. A small bolt-on acquisition, custom transformers manufacturer Plitron, will not make much contribution in this financial year. Plitron increases Acal’s exposure to North America and the medical sector. Oil and gas company Aminex (AEX) is selling a 3.825% interest in the Kiliwani North development licence to AIM-quoted Solo Oil (SOLO) for $2.16m. Solo will then hold a 10% stake and Aminex will own 51.75% and be the operator. 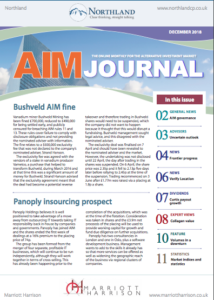 Latest AIM Journal available here.